Well, Spring Safari is over and it is almost summertime! April was extremely busy for the ODSC. We finished our first beginner class. Congratulations to everyone who participated and can now grace the dance floor as a beginner. Good times on the dance floor await you! We were lucky to have Steve and Kitty Earles teach our April SASS (share a shag step). They even had bonus content! We learned 2 together steps. The Spring Safari brunch had over 330 people in attendance. It seems that everyone had a great time! Sorry, that we were not able to teach the line dance, but we just ran out of time. Thanks to everyone who worked the merchandise tent during SOS. Cathy Jamiolkowski and Connie Livingston, our Ways and Means Chairpersons, sold over $4,000 in merchandise! Congratulations to all that participated. Many thanks to everyone who worked the Golf Cart Fundraiser tent selling tickets. We have paid for the golf cart and everything sold from this point on will be profit! We have approximately 2,000 tickets to sell. This fundraiser helps with all the expenses of our club. It helps to fund food for the parties, parade expenses, entertainment and DJ’s. If we have any left, then we also put some in the charity coffers for donation. Please take the time to sell tickets and to even purchase one yourself to help fund our club and all the fun things that we are able to do for our members. For the first time, the ODSC had 3 SOS Bar Crawls. We met at a different bar, most of us had some liquid refreshment and danced a little. Then, we moved to another venue. It was great to see so many ODSC members during SOS. We plan to do something similar during SOS Fall Migration. Thank you Terry McCoy for this great idea. The ODSC once again won First Place for Best Shaggin’ Troop in the SOS Parade. Thank you Wendy Schultz for all your hard work as parade chairman. Our theme was “Happy Trails” and the float and golf carts looked amazing! Frankly, all the ODSC members that participated also looked amazing. We had 91 people in the parade. It was fantastic! We will finish up the month with our Clean Sweep. Bill Bacon and Tim Webb certainly appreciate any help you can give them in cleaning up our lovely streets and beach after SOS! Now, on to May. We will start our second Beginner’s Class on Thursday, May 5th. This is free for ODSC members and you do not need to have a dance partner! On Saturday, May 7th, the ODSC will have a tent at Mayfest to sell golf cart fundraiser tickets. Please contact Billy Powell if you can help sell a few tickets and stop by and purchase one yourself. On Tuesday, May 10th, Lou Martino and Linda Campbell will be sharing a shag step with our members in the backroom of Fat Harold’s. We will finish up the month with a cookout at Saville’s on Second Street. A line dance, corn hole, great food and a great dancefloor will be the main attractions! I hope to see you at this event! What a great way to end SOS! The OD Shag Club, yes, once again, won 1st Place for Best Shag Troop in the SOS parade. Our theme was Happy Trails paying tribute to Don David, a lifetime member of the OD Shag Club as he retired as Parade Chairman for the SOS Parade. Brian & Debbie Schmitt led the troop carrying our fantastic “Happy Trail” banner! Behind them were a ton of cowboys and cowgirls whooping it up! That was followed by our fantastic float! Way to go Wendy Schultz for all the great float ideas and everything you did to make this another fantastic parade! I know that I can’t remember everyone on the float, but Sonny Tomberlin was a fantastic barkeep while trying to keep all the saloon girls in line! Linda Campbell just kept selling that wonderful elixir on the float. Rumor has it that the elixir was pretty darn good and had a kick! The creativity for the golf carts was mind-blowing! Congratulations to all the members with their fantastic golf carts! Naming just a few of our carts, there was a chuck wagon, a medicine wagon, a traveling chicken ranch, a gambling den of iniquity, Indians, a wagon with live chickens and of course, Blazing Saddles. I had numerous people stop me and tell me how great the troop looked and how much they enjoyed the show! We had 91 members participate with 16 vehicles! I must say that the SOS Parade is one of my favorite events. I don’t just enjoy the parade, but I truly enjoy getting together with fellow members and coming up with ideas and working together to make them happen. Once again, thank you to everyone that participated in any aspect of the parade! You make the ODSC proud! 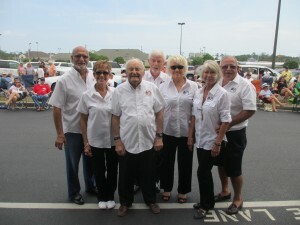 The OD Shag Club Dance Team danced at the Shoe Center during SOS Spring Safari April 20, 21 and 22 from 1pm thru 2pm. The days were beautiful with a temperature around 75 degrees. The weather was prefect to be dancing outside on the pavement. Our main objective was to get the crowd up dancing and they were very cooperative. Gary Lowder on Wednesday April 20, 2016. I would like to thank Mike Parnell from the Shoe Center for inviting the Dance Team to dance during these events. Mike and his great staff always welcome us with open arms. I would also like to thank the members of the dance team that danced at these events: Lou Martino, Linda Campbell, Lenny Gardner, Barbara Hopper, Randy Overby, Laura Hardee, Wade Kirdahi, Joyce Girling and Board Member Vic Gillispie. Sunday April 17th the O.D. Shag Club held their annual SOS Spring Safari Brunch at the OD Arcade. It’s always a fun time when over 320 of your closest friends get together to socialize and eat!! As usual Chris and his team at the Arcade did a wonderful job providing a great breakfast. Big thanks go to our Hospitality Committee for quickly signing everyone in and handing out the tickets for the Logo Wear and Name Tag drawings as well as those all-important colored food tickets! Donnie and the Food Committee, along with the server volunteers, did a fantastic job keeping the food line moving right along. It takes a while to feed over 300 people and we appreciate everyone’s patience during the process. Linda Morrison, Membership Chairperson, was set-up to take in new memberships as well as renewals. I understand we had 6 new members join Sunday morning. Welcome to the Club!! The Ways and Means Committee was busy selling new OD Shag Club logo wear and 50/50 raffle tickets. A big shout out to John Barringer and Nancy Sook for selling over $700 in tickets. Congratulations to the winners of the Logo, Name Tag and 50/50 drawings!! What would the Brunch be without Murl Augustine spinning the tunes from the DJ Booth? We appreciate his dedication to our Club. Unfortunately we ran out of time for the line dance class but maybe we can talk Kathy McCoy into doing it at the next party?? Thanks to everyone who participated in making the event a success and we look forward to doing it all over again in the Fall.